Welcome to Six Flags St. Louis where the brand new Mardi Gras Festival is taking place. All of the street lanterns in the front plaza area are dressed up for the festival. As soon as you enter through the turn styles this large gator greets you from the fountain. Front Street is all decorated with beads and masks. They are literally hanging everywhere in this area. They have several different characters posing for photos in this same area. The main festival area is the Palace Gardens. There they have several different vignette walls that have different scenes from Cajun history. It was neat that the park took steps to educate people about the different historical events surrounding Mardi Gras - it's not just a booze party with beads. I really liked the decorations on the Palace Porch Stage. Periodically through out the day, the Palace Porch Stage was the home to different acts. I happened to catch the Flowmenco Dancers. They had several different acts that were performed to different music. There was also a Jazz Band that performed during the day in the Palace Gardens. Roaming the park is another group that is composed of a drumline and a lone trumpet. I'm not overly sure how they tie into Mardi Gras, but they were entertaining. The park also has numerous specialty foods and drinks available during the festival. These are beignets and they are delicious. Also delicious is the Hurricanes which are served in a souvenir glass. The main event is the daily Mardi Gras parade which begins at 7pm by Tidal Wave. I loved how much excitement the parade created with the park guests. The floats were awesome and are apparently designed by a famous float designer for the New Orleans Mardi Gras parades. Even the Looney Tunes characters dressed up for the festival. The neat part about the floats is that they get park guests to ride and throw beads. Each of the floats had a unit of marchers matching that particular theme. Some of the units were a bit more risque compared to others. Some were a lot more. But the floats - they were all awesome. One unit was all about the Day of the Dead. I really liked this float's design. Of course we need a float that's all about 'MERRICA! Some huge beads on this float. The parade ended with Babs and Bugs Bunny as the parade's royalty. 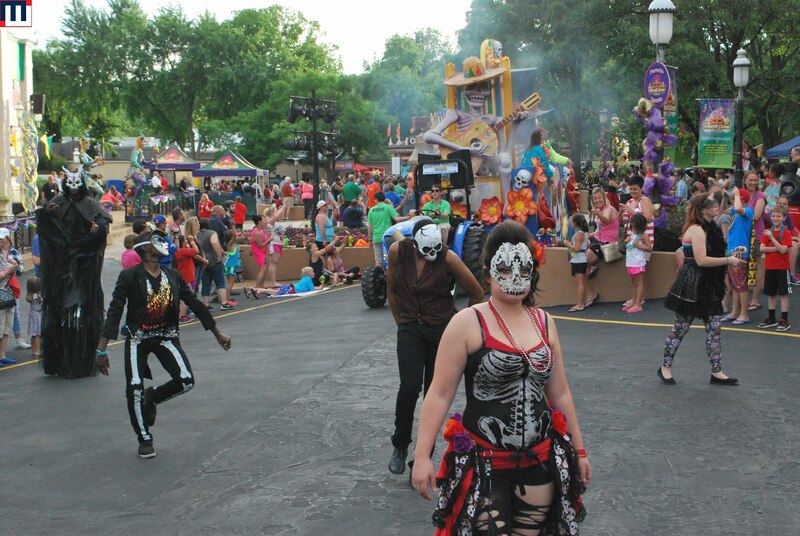 Mardi Gras at Six Flags St. Louis runs Wednesday-Sunday June 21-July 16.